Paul Dini got to live his dream: he was a lifelong geek who grew up to write for the animated Tiny Toons Adventure and Batman shows. But, just as his work on a classic Batman movie was getting underway, he became the victim of a violent crime. Dark Night: A True Batman Story recounts his fight to save his own life. The pivotal event in Dark Night happened more than 20 years ago, after Dini moved from the manic humor of Tiny Toons to the dark deco adventure of Batman: The Animated Series. He was riding high off an Emmy win for the Steven Spielberg-produced Looney Tunes successor and the critical acclaim for the Caped Crusader’s cartoon renaissance. But, if you’re looking to get an insider’s point of view that takes you behind the scenes of the creation of favorite Batman: The Animated Series episodes or Mask of the Phantasm, then Dark Night isn’t for you. It’s a brutally honest look back at the person who Paul Dini used to be, one that doesn’t shy away from the awkwardness, depression, and self-harm that he suffered through before and after his mugging. Dini told himself (and several therapists) that the trappings of his success were enough to stave off the voids in his social and emotional lives but, as Dark Knight unfolds, he shows readers how hollow his life really was. A friendship with an eager-to-network actress is what passed for romance in his lonely day-to-day existence. Connections with family and friends fell by the wayside as he worked on a dream job. But the fantasies don’t do enough to chase away the bleakness inside. Dark Night makes for a bracing, compulsive read because it’s filled with the excavated self-loathing of a man who lived a life envied by many fans. Dini uses Batman, Two-Face, and Poison Ivy and other familiar characters from the comics, video games, and shows he’s written as manifestations of his own roiling emotions. Watching the Joker urge Dini to give in to self-destructive impulses is one of the most chilling uses of the Clown Prince of Crime in a long time, precisely because there’s no safe remove of a fictional layer here. This graphic novel is what it looks like when a man who works with power fantasies revisits his own feelings of powerlessness. Dini writes that he struggled with writing Batman stories after the attack because here was no neat superhero-saving-the-day victory for him. Yet, after a long spiral into an abyss of alcohol abuse and dark thoughts, his journey to a healthier life takes inspiration in part from Bruce Wayne’s trauma-born alter ego. Most importantly, it’s made clear that getting back to work is only part of Dini’s recovery. Eduardo Risso—best known for his work on 100 Bullets—delivers some of the best work of his career on this book’s 128 pages. Whether hero or villain, the fictional characters in the book seethe with menace or indifference, making them chilling avatars for Dini’s innermost thoughts. The real people Dini moves amongst get rendered with masterful expressions and body language so that the awkward moods and prickly interactions resonate. The biggest takeaway from Dark Night is how important it is to be honest with oneself. 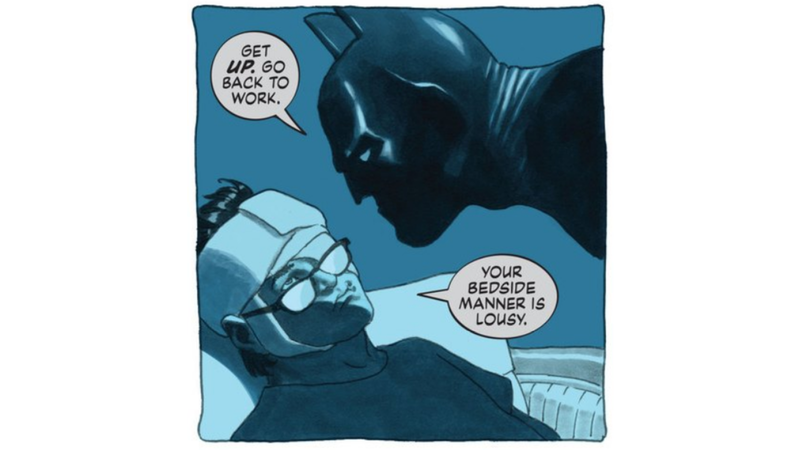 In the years since his mugging, Dini has seemingly prioritized the need to know and care about his own self as much as he cares about, say, the Bat-mythos. When it comes to moments of doubt and loneliness, taking stock of his own life—including an honest assessment of his abilities to cope and reach out for help—is more healthy than the ineffectual salve of nerdy pursuits. Batman and other superheroes can be an inspiration to people living in pain but, ultimately, we have to be the saviors of our own lives.